Third most successful Russian club in Soviet times, second in Championship titles since USSR's dissolution, CSKA's achievements cannot match those of another Moscow, Soviet Union, and Russia great, Spartak, but, in 2005 they did become the first Russian club to win a UEFA competition, plus, they are the most decorated team in the country in the 21st century, two major modern-era accomplishments that fill their fans with pride. 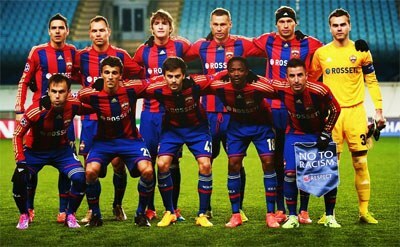 The PFC CSKA Moscow team in 2014. Professional Football Club CSKA Moscow, as is their official name, were founded in 1911, and were first called “OLLS” (ОЛЛС in Cyrillic characters), initials of the Russian words for Amateur Society of Skiing Sports. The team participated with success in the Moscow Championship, until the Soviet Union started having a national competition in 1936. The club had its first golden era right after World War II. Named “CDKA” (Sports Club of Central House of the Red Army) since 1928, they won all but one Championship titles from 1946 to 1951, the last one as “CDSA” (Sports Club of Central House of the Soviet Army). The last word in both names makes it all too clear who was the club's strong backer in Soviet times, and up until the first years of post-USSR Russia. The main man to watch back then was Grigory Fedotov. Born in 1916, he joined CDKA in 1938, and when he retired in 1949, having been part of the team that had won the first three Championship titles and the Soviet Cup in 1945 and 1948, he had scored an incredible 128 goals in just 159 games. Sadly, he passed away at the early age of 41, in 1957. His significance to the club's history is such, that four years after his death, when the team entered their new (back then) stadium, they decided to name it after him. CSKA (Central Sports Club of Army, ЦСКА in Cyrillic characters), renamed once again in 1960 to what we've known them ever since, had to wait 19 years to celebrate winning another Championship. That 1970 title was the only one that Vladimir Fedotov, son of Grigory, won, in the 16 years he spent at the club, his entire career. He was only 14 when his father died, and 17 when he joined CSKA. When he played his last game in 1975, he had worn CSKA's jersey in more than 400 games, Championship and Cup combined, a record that lasted for forty years. What makes his achievement even more special is that he served CSKA all those years playing half the games in a stadium that held his father's name, and, when he finished his career, CSKA had a deceased father and his son as their all-time leading goalscorer (Grigory Fedotov) and most capped player (Vladimir). CSKA spent another 21 years without a title, but compensated their fans by winning both the Soviet Top League and the Cup in 1991, which was the last season before Russia got its own national Championship. After a slow start in post-USSR era, CSKA really stepped on it after the turn of the century. They have won more Russian Premier League and Russian Cup titles than any other team since 2000, while in 2005 they made history by becoming the first Russian team to win a UEFA competition, the (back then) UEFA Cup, beating Sporting Lisbon in the final, at their own home, the José Alvalade stadium, in Portugal's capital city. CSKA's spectacular achievements in the first years of the 21st century have the names Igor Akinfeev, Sergei Ignashevich and Vágner Love written all over them. The first one, joined the Moscow club when he was just 16, in 2003, and has risen to become the most capped player in CSKA's history, having played in more than 500 official games. His partner in defense, Ignashevich, joined the club in 2004, and would be their most capped player if it weren't for Akinfeev. As for Vágner Love, in the more than 200 games he played with CSKA between 2004 and 2013, he scored 124 goals, and came incredibly close to breaking Grigory Fedotov's record from the forties. He would have definitely broken it if weren't for his spells (on loan) at Palmeiras and (mostly) Flamengo, from 2009 to 2012. CSKA's new arena since 2016. 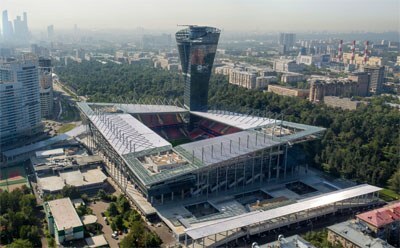 As of September 2016, CSKA are happy to be playing in their brand new stadium, one of the most recognizable worldwide, thanks to the vast skyscraper in one of its corners, resembling the trophy the club won by beating Sporting Lisbon in 2005's UEFA Cup final. The latest version of CSKA's logo has obviously the team's name in Cyrillic, the initials PFC (Professional Football Club) at the bottom, again in Cyrillic, and the founding year of the club, 1911, left and right of the ball in the middle. The ball itself is a relatively new addition. Unlike other top Russian clubs, CSKA have avoided adding stars on top of their emblem (with their 12 Championships they could have two, since in Russia each star stands for five Championships won), considering obviously that the mostly red star they already have, associated with their historic identity as the army's club, is enough.